Sending a video greeting might not seem like anything new. After all, from SnapChat and Facetime to SKYPE -- and all points in between -- video posts have become the way of the world. But context is everything, especially when you care enough to send the very best: yourself. This Christmas, the Australian Postal Service won’t just be send your gift -- they’ll be sending your personal video greeting right along with it. 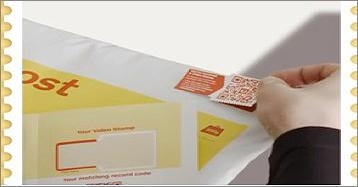 Here's how it works: When you’re ready to ship your holiday gift down under, you just stick the QR-Code enabled Video Stamp in the upper right corner of the package or envelope -- just as you would a regular stamp. Then, you just it drop it in an express post box or at the post office. Within 12 hours of shipping your package, you download the video greeting app and record your video gift message. When the gift arrives, your recipient just scans the Video Stamp, and voila -- up comes your video gift message. Check it out for yourself here. QR codes and video messages are nothing new. But by putting personal video greetings in context with holiday gifting, Australia Post has tapped into yet another simple way to use technology to amplify traditional human behavior, where the medium takes on a whole new kind of message. Which is why, for this creative, it's worthy of becoming the pick for this week’s Creative Media Blog: S.W.A.V.